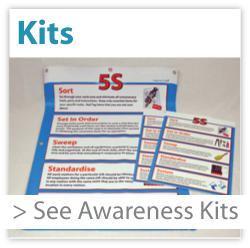 Fabufacture is proud to offer you a fantastic range of 5S educational and campaign support products for your business. All of our 5S products have been professionally designed by a combined team of experienced Lean Consultants, Black Belts, Training Officers and Graphic Designers. Our LARGE signs, enjoy a LARGE audience! Fabufacture’s Uniquely Large Formats – from A3 to 8ft x 2ft and larger! As well as providing award winning designs, our products are intended for industry and that means will are the only people to provide all of our designs in a very large formats including banners! Transliterated or translated into English, they all start with the letter “S”. The list describes how to organize a work space for efficiency and effectiveness by identifying and storing the items used, maintaining the area and items, and sustaining the new order. The decision-making process usually comes from a dialogue about standardisation, which builds understanding among employees of how they should do the work. There are five primary 5S phases: sorting, set in order, systematic cleaning, standardising, and sustaining. Eliminate all unnecessary tools, parts, and instructions. Go through all tools, materials, and so forth in the plant and work area. Keep only essential items and eliminate what is not required, prioritising things per requirements and keeping them in easily-accessible places. Everything else is stored or discarded. Arranging tools, parts, and instructions in such a way that the most frequently used items are the easiest and quickest to locate. The purpose of this step is to eliminate time wasted in obtaining the necessary items for an operation. Clean the workspace and all equipment, and keep it clean, tidy and organised. 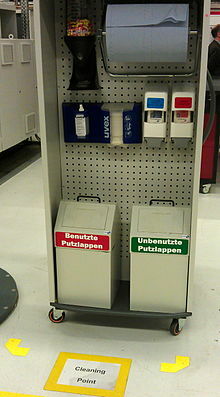 At the end of each shift, clean the work area and be sure everything is restored to its place. This makes it easy to know what goes where and ensures that everything is where it belongs. Maintain and review standards. Once the previous 4 esses have been established, they become the new way to operate. Maintain focus on this new way and do not allow a gradual decline back to the old ways. While thinking about the new way, also be thinking about yet better ways. When an issue arises such as a suggested improvement, a new way of working, a new tool or a new output requirement, review the first 4 esses and make changes as appropriate. It should be made as a habit and be continually improved.